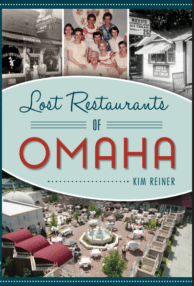 This summer, my family’s taking a road trip through central Iowa, exploring a big city and many small towns. Our first stop is Des Moines, the capital of Iowa. My kids have never been there, and the last time I spent quality time there, “Friends” was a new TV show. Time to explore the city again, right? The open road will be calling before I can check everything off the list, but here’s my Des Moines Bucket List, for future visits too. 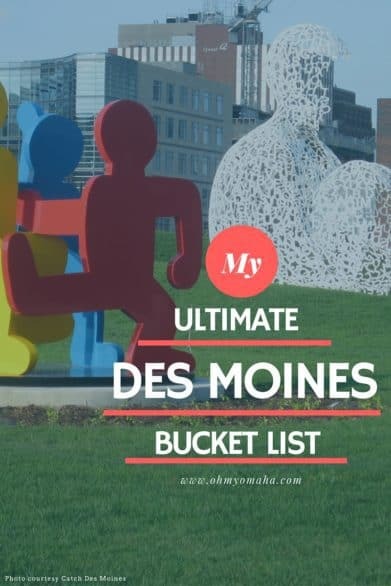 Start planning your Des Moines bucket list with help from Catch Des Moines! Eat at the TV Reality Show Darlings – I’m a sucker for a good restaurants, so if some television personality tells me a place is worth a visit, I’m so there. 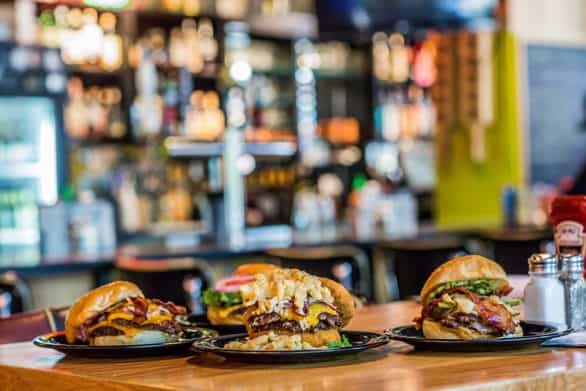 I think we need to venture into Fong’s Pizza (seen on “Food Paradise” and “Sandra Lee’s Taverns, Lounges & Clubs”) for perhaps a crab rangoon pizza or try a massive burger at Zombie Burger + Drink Lab (featured on “Today Show” and “United States of Bacon”). Keep Eating, This Time At Online Reviewers’ Faves – If I can’t find a show about it, I read what others loved while browsing online forums. Of the restaurants that stood out to me, the ones that might have a remote chance of appealing to my kids too, are barbecue hot spots like Woody’s Smoke Shack or Flying Mango, or the ultimate comfort food found at The Machine Shed. Time Travel – This area in Iowa is full of unique activities that are throwbacks to different eras. I’m certain a favorite will be the Boone and Scenic Valley Railroad, though technically, this isn’t a Des Moines attraction, I’m tacking it on since on our road trip route. 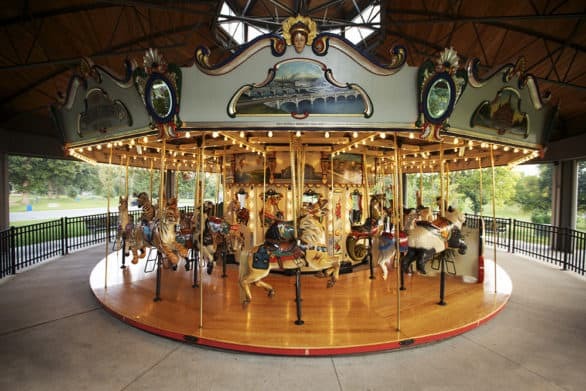 We also might check out the Heritage Carousel and rocket slide at Union Park. Living History Farms is another Des Moines staple that I cannot believe I’ve never been to. Admire the art – Des Moines has one of the Midwest’s biggest summer arts festivals, and it even gets international attention (International Festivals & Events Association awarded the Des Moines Summer Arts Festival with a Gold Grand Pinnacle Award in 2014 and 2015 as one of the “best festival in the world”). 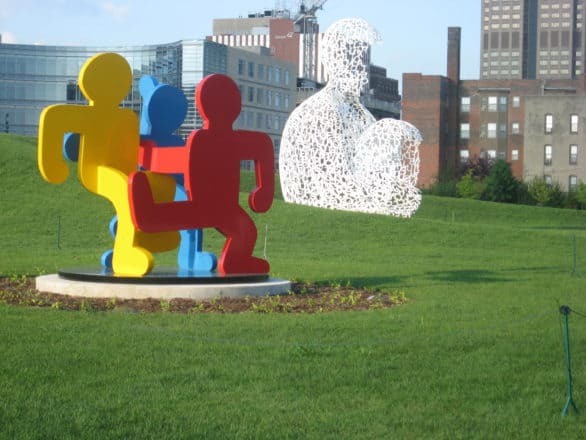 A permanent fixture on the downtown Des Moines scene is the John and Mary Pappajohn Sculpture Park. I’ve seen so many cute photos taken there, I need to take a few of my own while we’re there. Doesn’t hurt the vacation budget to visit either of these, too! They’re free. 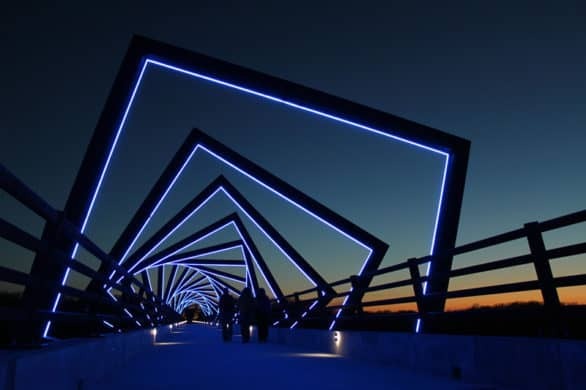 Walk the High Trestle Trail Bridge – Another freebie adventure for the family is to walk the High Trestle Trail Bridge. We’re an active family, so something like this appeals to us. If you’re going to take a hike or bike ride, do it somewhere scenic, right? This 13-story high bridge is found on a much larger trail north of Des Moines. Look for the bridge spanning the Des Moines River along the trail between Madrid and Woodward, Iowa (OK, you got me again, it’s not technically IN Des Moines, but at least it’s closer than Boone, right?). Sneak some learning in while on vacation – Most trips, you’ll find the Oh My! Omaha family stopping at a museum of some sort. 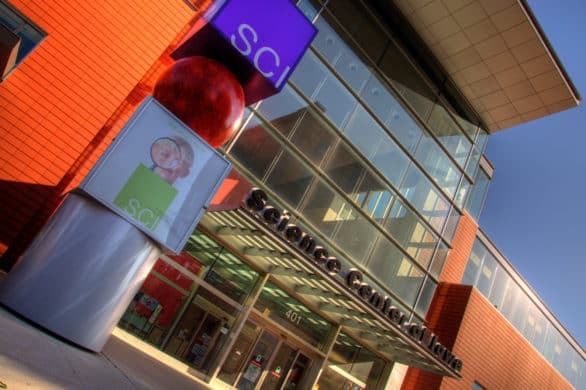 The Science Center of Iowa looks like it’d be a hit with the kids and the grownups on the trip (we’re just big kids, after all). I can see us spending a lot of time in the Small Discoveries area catering to the 7 and younger crowd, but there are two stories to explore there, so no doubt we’d attempt to explore it all on our trip! Have a day of thrills – My kids would love Adventureland. What kid wouldn’t love a huge theme park? I haven’t been there in ages, so pretty much everything there would be new to me. What I’m thinking would be my favorite if we were to visit on a hot summer day? Adventure Bay. Looks fun, doesn’t it? Please add in the comment section places you think should be on this list! What restaurants, attractions, and photo opps do you recomment? We are also going to Des Moines this summer. My husband and I lived there for 7 years and our 4-year-old was born there, but we haven’t been back in three years. The downtown Fong’s Pizza is unfortunately closed right now due to a fire in the apartments next door this last week. My fingers are crossed they will reopen soon. If not, there is another location in Ankeny. Not the same, but I’ll still get my Crab Rangoon Pizza fix! Zombie Burger and The Machine Shed are also great. 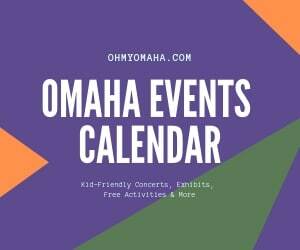 We will most definitely be going to Adventureland, the Downtown Farmer’s Market, Raccoon River Park beach, and maybe the Science Center or Living History Farm. Thank you for the heads up on the Fong’s Pizza closure! It’s probably going to be closed when we visit. 🙁 How far is Ankeny?! Never heard of Raccoon River beach but definitely sounds like a place I’d like to visit. Ankeny is just north. About as far from downtown as Altoona (where Adventureland is) is east. Racoon River Park is in West Des Moines near Valley Junction (the old WDM downtown, which is adorable). There’s also a nice playground and a splash pad. You must go to Farmers Market – wonderful family friendly way to spend Saturday morning. Raccoon River, Saylorville and Grays lake are both good places to get some beach time in. 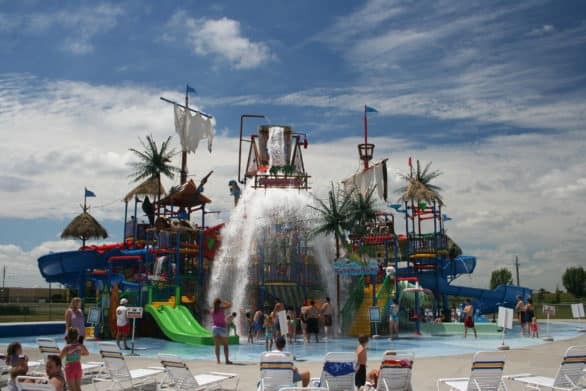 Check out the city of Des Moines page for a long list of splash parks and wading pools. The Whole Foods there has a dedicated kid play area if you looking for something healthy and quick. HyVee Marketplace Grills are also great for quick inexpensive family friendly food (good happy hour for mom and dad too). I believe Gateway Market still has kids eat free Monday’s. In that neighborhood is A-Dong – great noodle bowls. La Mie can’t be beaten for pastries. Cheese Shop and Vam Foss in the same neighborhood are fun places for mom and dad. Jordan Creek Younkers has the wine experience – you can drink wine while shopping at Younkers – they also have a tasty menu of bistro fare. Check out Z Mariks for Mac n Cheese Monday – wonderful noodle bowls and salads here. Best mom and dad happy hour in town in my opinion is Django (wonderful dishes with a French twist charcuterie with local cheeses and meats raw bar, great cocktails and never a corkage fee). Many other great eateries and fine dining in this neighborhood and Exile Brewery has excellent food too in addition to their brews. Of course Creme Cupcake is a must-do. While downtown the Des Moines Public Library is beautifully designed and has a great children’s area with play area. So many great tips, especially the restaurant ones. We must have similar tastes, they all sound like places I’d love!